Goddess Braids or a Halo braid is a sleek braided look that can be worn with just two rows and still look magnificent.You can do this with your natural hair or do the goddess braid with added braiding hair too. 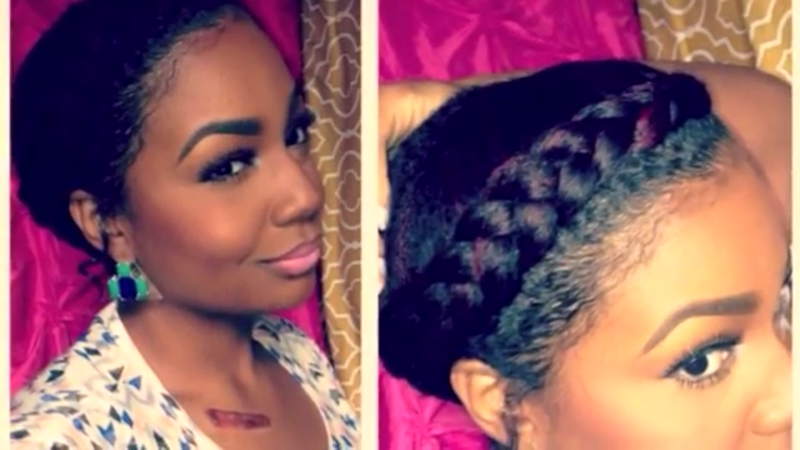 I love doing this style when I am home and want to do a quick hairstyle for my natural hair. The only skill really needed is how to properly stretch or blow out your hair if you are natural or relaxed.Just make sure you use a good heat protectant on your hair to avoid heat damage. Then all you have to start doing is braiding. You’ll need a rat tail comb, your favorite hair moisturizer, gel and/or edge control. Start with freshly washed and stretched hair. You can stretch your hair with a blow dryer or use whatever method you feel comfortable using. Part hair into a deep side part and part the crown of the hair. Use your favorite edge control or gel around the perimeter of your hair to lay your edges. Begin braiding around your hair staying close to the edge of your hair. Repeat the same steps for the side that you have left out.